ONATHAN WAS THE son of Saul, the king. He loved David greatly, and regretted that his father, through jealousy, sought David's life. David, after the last attempt of Saul to smite him to the wall by a javelin, fled away, and meeting with Jonathan said: "What have I done? What is mine iniquity, and what is my sin before thy father that he seeketh my life?" Jonathan sympathised deeply with his friend, and tried to save him. He promised to ascertain whether Saul fully intended to kill David, and, if so, to inform him, that he might escape. Meantime David was to remain in hiding, but on the third day Jonathan was to return with the required information. 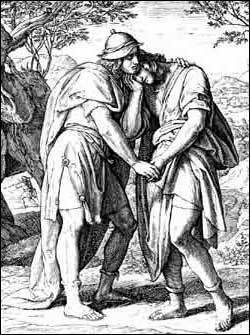 Before they parted they entered into a solemn covenant, one with the other, to remain firm friends during life; and David promised to show kindness to Jonathan and his children, after God should make him king. At the time appointed, after ascertaining that Saul still sought David's life, Jonathan went to the field where David lay concealed. Jonathan took with him his bow and arrows and a little lad. Shooting an arrow beyond the lad, he cried, "Make speed, haste, stay not!" These words were intended as a warning to David to flee quickly. When the lad had gone, David arose from his hiding place and came to Jonathan, bowing three times before him. Then they kissed each other, wept, and again pledged themselves to be faithful; after which David fled, and Jonathan returned to the city.